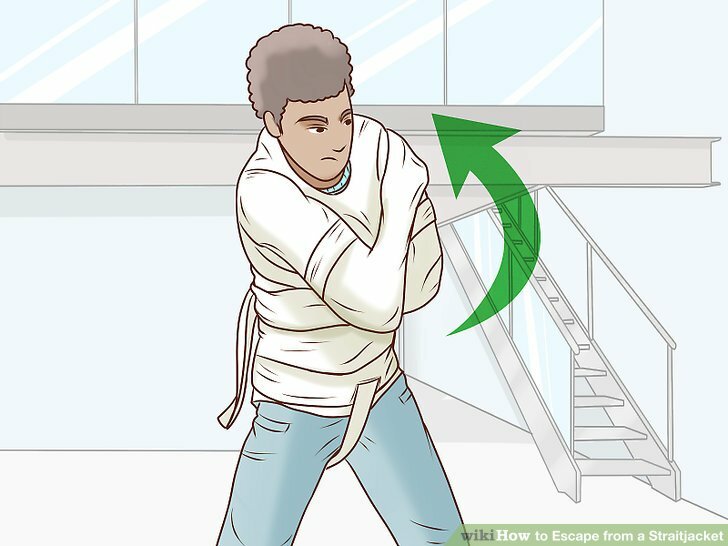 Even though straitjackets were designed to restrain someone who's in danger of harming themselves or others, magicians and escape artists often escape from them as part of their acts. If you’re trying to become like Harry Houdini, you may want to consider learning how to perform this trick, which was one of his most famous! 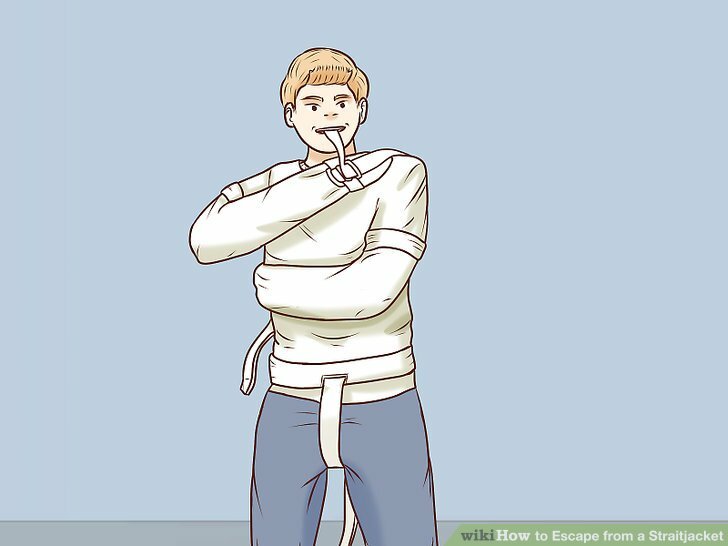 Fortunately, although it may seem impossible, escaping from a straitjacket is a trick that almost anyone can learn how to do. Pinch the straitjacket as you’re being buckled up, if possible. Use one of your hands to inconspicuously pinch the front of the jacket as it’s being put on you. This will end up giving you about of slack that will help you tremendously later on. You may not be able to do this if you’re being watched closely or you can’t maneuver your fingers this way for some reason. But don’t worry, this isn’t completely necessary for escaping the straitjacket. 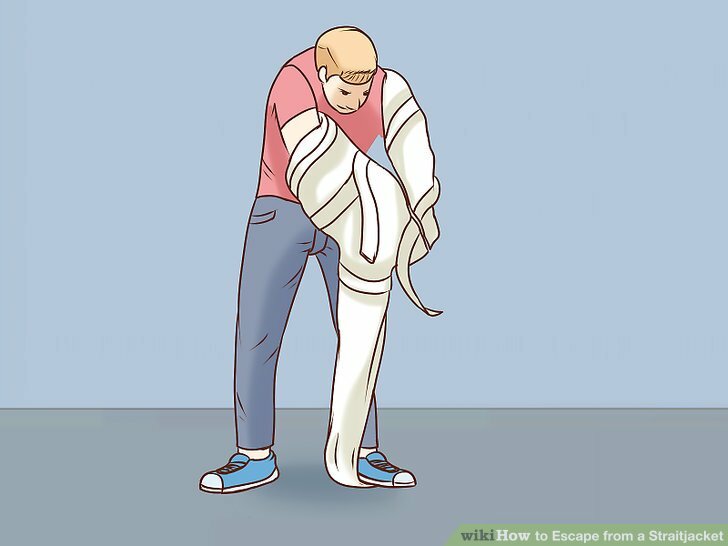 Breathe in and expand your chest when the jacket is being put on you. Take a deep breath and tighten your muscles in order to make your upper body as big as you possibly can. 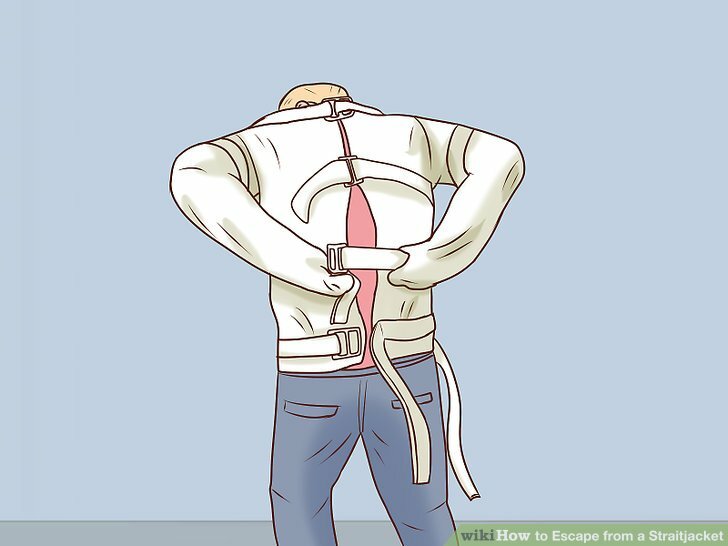 Then, once the straitjacket is fully on, let the air out of your chest and loosen your muscles to put more slack in the jacket. After the jacket’s been put on you, try to make your upper body as small as possible. The smaller you are, the easier it will be to get out of the straitjacket. Push your strong arm up forcefully towards the opposite shoulder. Using the slack you’ve managed to give yourself, work your dominant hand up the other arm and towards the opposite shoulder. This will move the slack in your jacket to where you need it to be for the next step. As your sleeves are pulled behind you, try to make sure your stronger arm is over your weaker arm. This will make performing this step a lot easier. If your dominant arm isn’t above your weaker arm, simply perform this step with the arm that’s closest to your head. Bring your strong arm up and over your head. Move your head down and towards your elbow in order to make it easier to move your arm over your head, if necessary. Keep your weak arm where it’s at. Once your strong arm is over your head, pull it down to the front of your body. 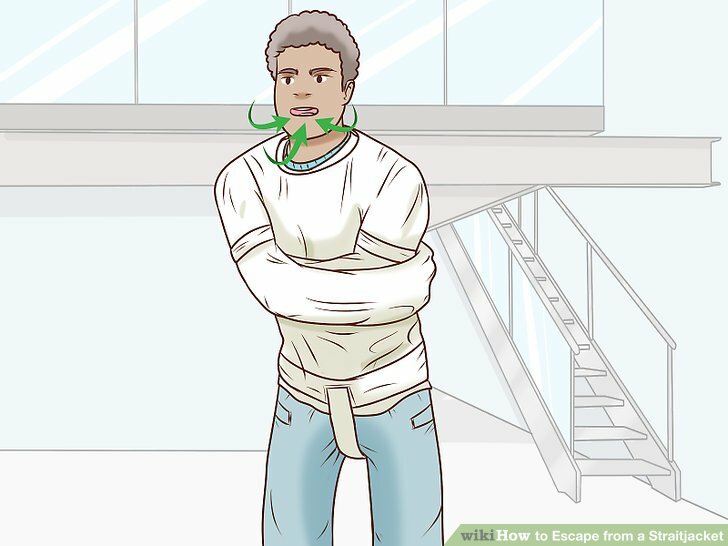 Once you’ve done this, you should be able to move your arms around inside the straitjacket. Unbuckle the sleeve buckle with your teeth. Once your arms are loose in front of you, bring the sleeve buckle up to your head and use your teeth to undo it. If you have weak or fragile teeth, you can also use your surroundings to do this. For example, work the sleeve buckle against a nearby table or door knob to push the strap out of the keeper. Once it’s out, use the same technique to get the tongue out of the hole in the strap. Use your free hands to unbuckle the buckles behind you. You don’t have to unbuckle all of the buckles behind you; just the top and bottom ones. Simply put your arms behind you and work from underneath the canvas of the jacket to undo the neck and body buckles. Your hands will not be out of the straitjacket by this point, so what you’ll need to do is grip the buckles while your hands are still covered by the canvas of the jacket. Step on the sleeves to pull off the straitjacket. 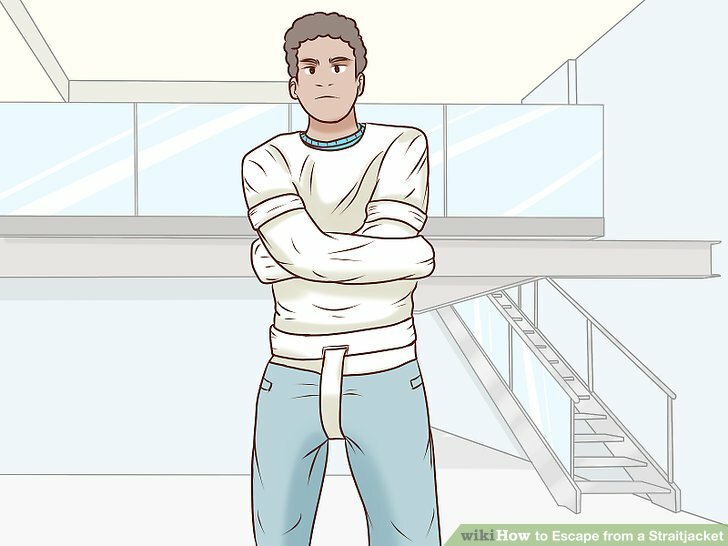 Bend your body forward and lower the sleeves of the straitjacket so that they’re on the floor. 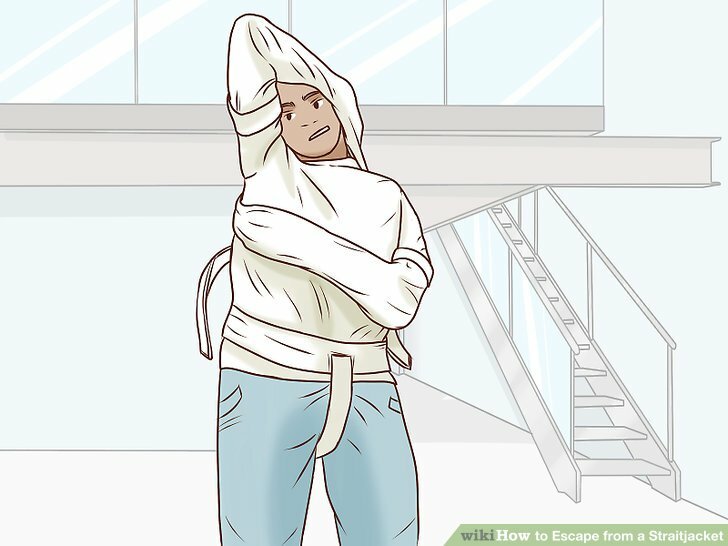 Step on the ends of the sleeves, then pull your body upwards and backwards to remove the straitjacket. Keep the person who helped put on the jacket close to you, just in case you can’t escape and need help getting out. Never try to do this by yourself! Will Laali finally escape from the haveli?